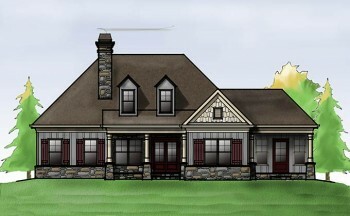 Oconee River is a 3 bedroom floor plan with a 2 car garage and an open living floor plan. With horizontal siding, stone accents and shake, the exterior of Oconee River House creates a stylish blend of architectural details. This open floor plan evokes a spacious feel throughout the house. The family room features an elegant coffered ceiling and a fireplace on the rear. A large master suite accompanied by a tray ceiling, walk-in closet and master bath adds to the excitement on the main level. The two car garage comes with plenty of room for storage and is conveniently located near the kitchen for unloading groceries. On the upper level you will find a bonus room, loft and two bedrooms with their own walk-in closets and a Jack & Jill bath.